Are you looking for some good instructions for building a handrail or help regarding hand railings? If you are thinking of building a stair railing or updating a hand railing you can save the costs of hiring a professional. So put that money back in your pocket and read on. With this handrail eBook you will save yourself a tremendous amount of time and money by avoiding costly mistakes that can easily occur with this type of advanced trimming project. This eBook costs less $$ then 2 spindles, think about that. Would You Like To Benefit From The Experience of Someone Who's Built Over 250 of Them? Lets face it building a hand railing can be a big and complex project depending on your particular situation. The trim wood which makes up a hand railing can be quite expensive and mistakes can be costly. There are also Osha Codes in place for hand railings that need to be followed for your protection as well as others who come in contact and use this railing. Fortunately you are at the right place to get the answers and guide you through the process. 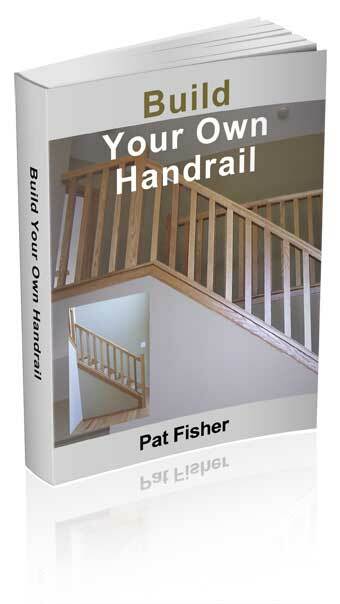 I have just read your book "Build your own handrail" and I must say that I am very impressed. I have been building stair railings on and off for almost 50 years and there is an old saying that "you can't teach an old dog new tricks". Well I'll tell you, I learned a lot from your book. Your step by step method with plenty of photographs and sketches is easy to understand and you showed few useful products and tools that I have never seen before. I would recommend your book to anyone who is planning to build their own handrails. Thanks for the great book. I do all fazes of construction around my properties and your book always comes out when I am tasked to do the stair and finish carpentry. Its easy to understand and I get the job done and it looks great. I would recommend this book to the home owner and contractor alike. The greatest benefit you will enjoy is the simplicity of how this eBook is written. Simple enough for anyone to understand and follow. *Also the formula for spindle or balluster spacing with the Osha codes. Building a handrail is like building your own personal master piece and the rewards of a project like this are truly great. This new hand railing (That you built) will give you much pride and gratification and your efforts will be appreciated and felt for years to come. My personal e-mail will be included should you have any questions concerning this eBook or during the process of building a stair railing. Get your copy now!! This E-Book comes to you in PDF format, that can be viewed with free Adobe Acrobat Reader software.